The Dell Latitude E6400, the update to theD630, packs in all the essentials needed to keep road warriors productive on the go: a speedy Intel Core 2 Duo processor and a host of security and durability features. Factor in the revamped design, which replaces its predecessor’s stodgy aesthetic for one that’s much more streamlined and visually appealing, and you have an excellent notebook for demanding business users. 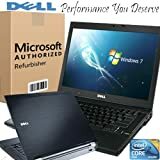 This entry was posted in Laptops And Tablets and tagged 120GB, 2.26Ghz, 4.0GBRAM, Dell, E6400, Laptop, Latitude, P8400 by Computer Education World. Bookmark the permalink.